Introduction The Santa School The RoadshowSanta DVD Reindeer for Hire Santa's WisdomChristmas PlayPhoto Galleries Santa with Stars! THE FANTASTIC Santa School Roadshow could be coming ... to your town!!! Make Christmas extra special in your town or village this year - get the festivities off to a fantastic start with a visit from the SANTA SCHOOL ROADSHOW. and of course the great man himself SANTA CLAUS. Hosted by Gilly Fraser, with lots of opportunities for children to participate. With added extras of Happi the Clown, Stilt-walker and Juggler Mike Angelo + lots of give-a ways for the youngsters. With the added extras of Scottish/Jazz/Peruvian band, plus the sweet sounds of a school choir. AND... for just a few more carrots - we can bring Santa’s Reindeer too! Don’t get left out in the cold this Christmas! Santa's on his way... with his very own ROAD SHOW!! 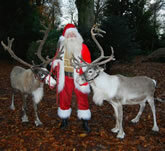 If you would like to know more about The Santa School Roadshow - please call 01461 337370 / 078820 93665 or send us an email.